Will Italy Pull Its Troops out of Afghanistan? Why has it been nearly impossible to coax Taliban fighters into turning in their weapons and cooperating with the Afghan government? The story of Mullah A stands as an all-too-common example. A few years back, the Taliban commander thought his personal war with the Americans was over when he surrendered his Toyota Land Cruiser, a stack of rocket-propelled grenades and his personal weapons to the police chief in Kandahar. Mullah A, who prefers not to be identified, was exhausted. In late 2001, when U.S.-backed forces were pushing into northern Afghanistan, the commander saw most of his men wiped out by heavy American bombardment. He was one of the few survivors, and he fled south, back home to Kandahar, convinced that his fighting days had come to an end. As part of the surrender, Kandahar's police chief gave Mullah A a letter of protection. But the would-be ex-guerrilla fighter soon realized the paper was worthless. Like so many other Taliban who tried to lay down arms, the commander had a complex history, interwoven with tribal rivalries and greed. The CIA was offering $100,000 for the return of Stinger antiaircraft missiles, and the local intelligence chief, who belongs to the enemy Achakzai tribe (allied to President Hamid Karzai's Popalzai tribe), was convinced that he could make good money if he shook down Mullah A to see if he was holding back a few Stingers. "I told him I didn't have any," Mullah A informed TIME by telephone. That resulted, the Taliban commander alleges, in the Achakzai intelligence chief arresting and torturing Mullah A's brother and cousin. "My cousin was strangled to death," the commander says. Out of rage and also out of fear for his own life, Mullah A rejoined the Taliban. Nowadays, he and his men ambush U.S.-led coalition targets in Helmand and Kandahar provinces, and he brags to TIME that recently his outfit blasted a dozen rocket-propelled grenades into the NATO base at Kandahar. Greed. Mutual suspicion between Karzai and his Western allies. Pro-Karzai tribesmen elevated to government posts only to take revenge against their ancient rivals. These factors contribute to the catastrophic failure of attempts to wean the guerrillas away from fighting. And unless the situation changes  rapidly  it is unlikely that the next government of Afghanistan will fare any better at winning over the Taliban. Indeed, the next government will probably be led by Karzai, who will lack credibility after the pervasive claims of vote-rigging in the presidential election. Given that everyone from President Obama on down to his military commanders and Karzai now say that the Taliban cannot be defeated militarily, retooling efforts to reconcile with the Taliban may be the last chance for a durable peace in Afghanistan. Where did it go wrong? First, the U.S. and Karzai had different goals. The Afghan President wanted an amnesty extended to all Taliban, from their leader Mullah Omar down to the lowliest turbaned jihadi. "The Americans said 'No way. We don't deal with terrorists,' and they excluded the leadership," one senior Afghan official explained to TIME. One tactic that worked well in Iraq has not been used in Afghanistan. The U.S. forces in Mesopotamia were able to buy off the Sunni insurgency there by offering a monthly wage of $300 for each of 90,000 fighters. No such incentive has been offered to the Taliban. One Western official, closely connected to efforts to reach out to the Taliban, blamed the failure squarely on President Karzai. In Kandahar and Helmand, which are now major Taliban strongholds, the official says, Karzai personally appointed many "violent and predatory" district officials and police chiefs from his own extended tribe. "When the police started robbing and pillaging," the Western official says, "the villagers had no choice but to turn to the local [Taliban] commanders for protection." In early 2008, Karzai set up a Peace and National Reconciliation program headed by his old mentor, Sibghatullah Mojaddedi, a religious scholar and former President. The U.S. and other donors put up $3 million, but refused to contribute more after they learned that Mojaddedi, 83, spent a large chunk of the money on salaries for his family and loyal retainers. "Mojaddedi's people say they had 5,000 Taliban hand over their guns," says one angry Afghan official, "but I asked them if they had any big commanders among them, and they couldn't name a single one." The cutoff in new Western funds to the program has crippled whatever chances the amnesty project had of coaxing in Taliban fighters. The Kandahar office says it now operates with a budget of $700 a month and has only reeled in 537 disaffected Taliban in nearly two years. "We can only offer them $20 for their weapon. They can get far more than that in the bazaar," says Kandahar director Haji Agha Lalai. "We should be able to give them a job, rent money, but we can't." This paltry offering cannot compete with the wages and benefits that a Taliban fighter collects from his commanders who, Afghan officials allege, are bankrolled by Pakistani intelligence services covertly helping the Taliban regain ground. 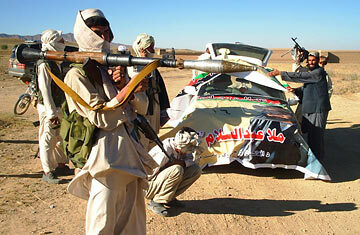 Many returning Taliban are also hounded by other Taliban, who see them as traitors. Their old foes too have not ceased to pursue longstanding feuds. An ex-Taliban commander, who goes by the single name of Gargari, says he has been afraid to return to his home in the northern province of Mazar-e-Sharif because he says that the warlord Mohammed Atta is threatening to kill him to settle old scores. In Helmand, where coalition forces have encountered fierce Taliban resistance, British officials rightly concluded that many of the Taliban fighters were local tribesmen with grievances against Karzai's personally appointed officials, many of whom were shaking down villagers for bribes. In 2007, A British-led program to rehabilitate Taliban fighters and give them job training was abruptly shut down by Karzai himself, who accused the British of colluding with the Taliban. The situation is complicated by a century and a half of suspicions about Britain's colonial legacy in Afghanistan. The few attempts by Karzai to reach out to Taliban leaders fizzled largely because the Taliban wanted a third-party to act as go-between. The President either sent his brother or a few Taliban defectors who were distrusted by their former jihadi comrades. Mullah Omar broke off talks through Saudi Arabia several months ago, saying that the Taliban would only talk with Karzai once all foreign troops had agreed to withdraw from Afghanistan. Taliban experts say that, if anything, the fraud-tainted elections have damaged Karzai's standing so badly that the Taliban and their supporters in Pakistan no longer see the need for peace talks. In other words, says Taliban commander Mullah A, "We believe we will win."